I first started using VMware in the 2003-2004 timeframe, beginning with VMware GSX Server. I loved the idea of running multiple OS instances on a physical server in order to provide more fine-grained resource utilization and workload isolation. It wasn’t long before I transitioned to VMware ESX just after the release of ESX 2.5, and I achieved my first VCP on ESX 2.5. (I guess that makes me a VCP2/3/4/5.) Moving to ESX Server was, for me, fabulous; the ability to migrate virtual machines between physical systems (what we call vMotion) was revolutionary. It’s kind of funny now how we almost take it for granted. At the same time, I was also exploring the use of VMware on the desktop, using VMware Workstation and—immediately upon its very earliest “Friends and Family” release at VMworld 2006—I switched to VMware Fusion on a MacBook Pro. When the VCDX was first announced, I immediately decided to go for it. For years, I had considered pursuing CCIE, but not being a full-time networking specialist that was (and still is) very difficult. Here, though, was a CCIE-type achievement targeted at virtualization, something I was doing all day every day. For me, it was a no-brainer. I simply had to do it. I completed the Enterprise Administration exam (now referred to as VCAP-DCA) in March of 2009, and was anticipating taking the Design Exam almost immediately afterward. For whatever reason, though, I was unable to get into the Design exam beta. Those that did get into the beta were eligible to participate in the first VCDX defences at VMworld 2009. 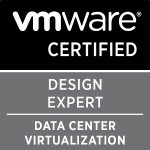 I had to wait until early November of 2009 to take and pass the Design Exam (now known as VCAP-DCD). I submitted my defence design in late December 2009, and defended at VMware Partner Exchange (PEX) 2010 in Las Vegas. The rest, as the saying goes, is history. Go for it! Among the other things that pursuing VCDX taught me, one of them was that pursuing a goal such as VCDX is a worthwhile endeavour. If you’re already working with VMware virtualization every day, why would you not pursue it? Having a goal like VCDX helps shape your learning, helps drive you to a deeper understanding of the technologies and concepts, and sharpens your ability to tie that technical knowledge back to the business. All of those things, in my mind, are beneficial apart from the certification. As for tips or tricks, I can only say that you need to go both deep and wide. You need to be deeply proficient in the products, but you also need to be able to take a wide view of how all the products and technologies fit together and relate to each other. That’s a tough question. Life was really crazy at that time—I was in the midst of writing Mastering VMware vSphere 4 (which was released at VMworld 2009) and VMware vSphere 4 Administration Instant Reference. I was doing that while studying for ESX 3.x exams (the Enterprise Administration and Design exams were, at that time, still based on VI3). That was a challenge for me. I think if I had it to do over again, I probably would have focused more on the certification instead of having several major projects going on at the same time. Of course, life doesn’t always give you that luxury! Was it worth it? Absolutely, but not necessarily in the way you might expect. For me, the value in VCDX was in the achievement of a personal goal, the achievement of excellence in a technology that I enjoyed using. I achieved VCDX shortly after joining EMC (I joined EMC in January 2010, and I achieved VCDX in February 2010), and EMC didn’t really respond differently to me afterward. That’s OK, though, because I wasn’t really doing it for any reason other than to satisfy my own drive for achievement. Categories: Certifications, VCDX, Virtualisation | Tags: spotlight, VCAP, VCDX, VCDX5, VMware | Permalink.